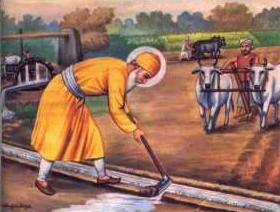 Dharam Di Kirat Karna is work ethics in Sikhism. Sikhism lays stress on honest and truthful labor (Das Nauhan Di Kirat ). It considers work ethics as essential ingredient for harmonious society and recommend that a Sikh must earn his livelihood with the sweat of brow and share the earnest earnings with the needy. Sikh religion believes in the creed of worker and complete dignity of labor by leading a truthful and honest life. A Sikh should be up and doing. There should be no idle rich man and no exploitation of the poor by the rich. All must labor and must sweat to create the foodstuffs. This would eliminate poverty. The human body should be working for the well-being of the family and society but the mind has to remain tuned towards God. The Sikh is required to do an honest living through truthful means and live the life of a householder. The Sikh Gurus believed that greatest of the evils and the worst of crimes is poverty. Thus, Guru Nanak Dev started the institution of Langar so that no body should sleep without food. “The true Sikh of the Guru shall make an honest living by lawful work. It is believed that no one can be honest and wise on an empty stomach. Such person will not think independently. A person with an empty stomach cannot be morally sound. A starving person can commit unsocial and immoral acts. A parasite can be a victim of his bread-giver and can act as his master wants him to. After 22 years of long travels, Guru Nanak Dev settled at Kartarpur and became a farmer just to earn his livelihood with sweat of his brow. When free from his teachings, he would work in his fields to earn honest living which were shared in Langar by the visitors. The dishonest earnings are declared Haraam as sucking the blood of the poor. Story of Bhai Lalo and Malik Bhago is very clear to prove that Guru Nanak did not eat food prepared by Malik Bhago as it was the result of his dishonest earning. On the other hand, Guru Nanak ate very simple food prepared by Bhai Lalo with honest means. There is temptation in every materialistic person to lead an easy and comfortable life. There is desire to collect money overnight and through unfair means. The Gurus showed us the path that dishonest earnings pollute the mind and are hindrance in the way of pure and pious life. Sikhism emphasis truthful life and pious living. According to Sikhism, dishonest earning is prohibited to a Sikh. It is like a blood which will stain the clean cloth. Sikhism is a way of life. It is a guide for our daily routine. It believes that Truth is the highest of all, but higher still is the truthful living. Sachon oarai sab ko ooper sach achar. Earning of livelihood through legitimate effort. Sikhism attaches great importance to the human life, dignity and freedom of the individual and the sacredness of human personality. According to Sikhism, human life is a gift of God and this gift must be respected. The Gurus stressed that co-operative and corporate living endeavour of individuals is essential to run social and religious life on principle of free, harmonious and happy living. Sikhism lays stress on honest and truthful labor (Das Nauhan Di Kirat ) through legitimate and creative effort. It considers work ethics as an essential ingredient for harmonious society. It recommends that a Sikh must earn his livelihood with the sweat of brow and share the honest earnings with the needy and less fortunate in a spirit of love and service. Sikh religion believes in the creed of worker and complete dignity of labor by leading a truthful and honest life. It obligates a Sikh to share the earnings with needy and sick. In Sikhism, non-observance of the obligations towards the community means alienation from the Divine. A Sikh should be up and doing all the times. There should be no idle rich man and no exploitation of the poor by the rich. All must labor and must sweat to create the foodstuffs. The idea behind is that it would eliminate dependency and poverty. Sikhism does not encourage those who live as parasites on the society. Every Sikh is required to do an honest living through truthful means and live the life of a householder. Although, human body should be working for the well-being of the family and society but the mind has to remain tuned towards God. The Sikh Gurus believed that greatest of the evils and worst of the crimes is poverty. Thus, Guru Nanak Dev started the institution of Langar so that no body should sleep without food.